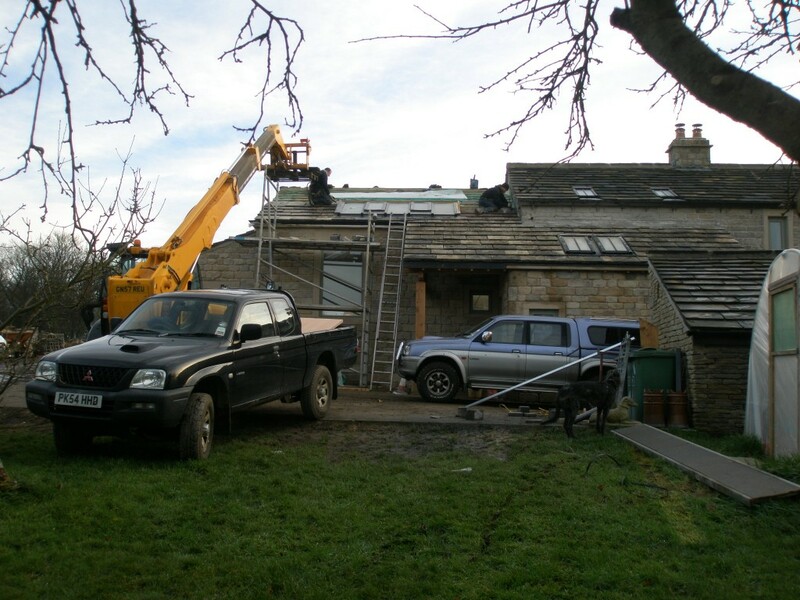 The first job is to clean up the new roof timbers. These had been previously been coated with Osmo UV Protection oil. This was necessary as the oak was exposed to the elements while the roof was being built. If we had left it untreated, the mud and rain would have soaked into the wood and been very difficult to remove. Cleaning up the oak involves softening up the previously applied Osmo with white spirit. Then rubbed it down with wire wool, before finally wiping it down with a clean cloth and white spirit. The more persistent marks will be sanded out. Fortunately, there aren’t too many of these. The final stage will be a second cost of Osmo (this time the internal PolyX version) to reseal the wood. By the time we get to the end of the first day, the beams in the kitchen have been cleaned ready for a coat of Osmo next week. These timbers had been previously coated with Osmo exterior wood finish. To get the dirt and finger marks off them, they are wiped down with a cloth dipped in white spirit, then rubbed with wire wool dipped in white spirit and then finally wiped down with a clean cloth (again dipped in white spirit). We have had a couple of problems with water leaking into the building – one from under the floor and the other through the roof. When the new concrete floors were laid in the extension, a 75mm insulation board was put down first and then 75mm of screed on top. The underfloor heating pipes are fixed to the top of the insulation boards and the screed is laid on top. The hot and cold water to the bathrooms, along with the heating for the towel rails, is run underneath the insulation. We pressure tested all of the pipework before laying the screed, but unfortunately it looks as if we have a leak in one of the downstairs bathrooms. The underfloor heating is fine since it is maintaining pressure (if there was a leak the pressure would drop) and the floor seems to have started to dry out now that we have turned off the water to this part of the building. Next job is to dig up part of the screed to find the leak. This shouldn’t be too bad as the wet marks in the floor are giving us a clue where the leak is! The last place to dry on the floor is probably where we will find the leak! A job for this week. It looks as if the leak is under the floor in the bottom right hand corner. 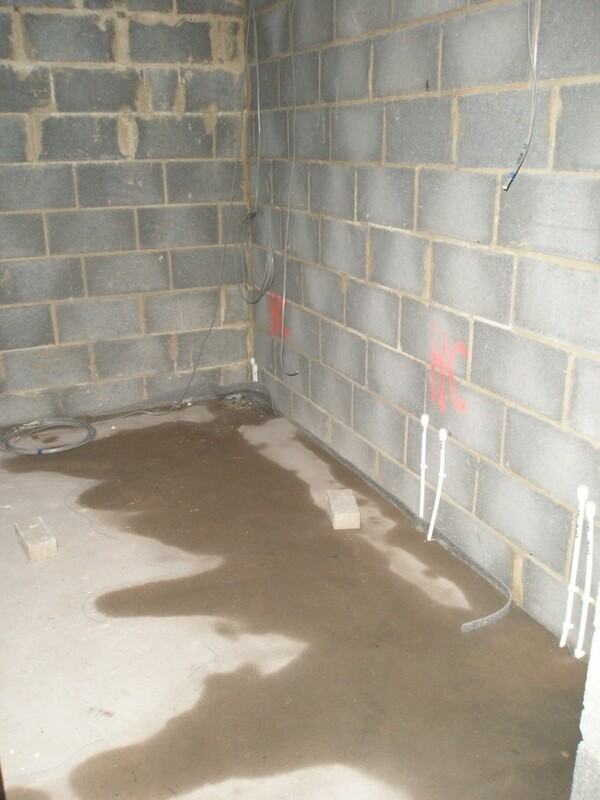 As the floor dries out (we have turned the water supply off to this area), it slowly reveals the location of the leak. The water has travelled along the gaps in the insulation boards under the floor and then soaked through the concrete screed. The next problem is in my study. Rain appears to be getting in the joint between the roof and the wall. The roof here is a simple mono pitch roof. We have increased the height of the lead upstand on the outside. This has improved the situation, but rain is still clearly getting through. 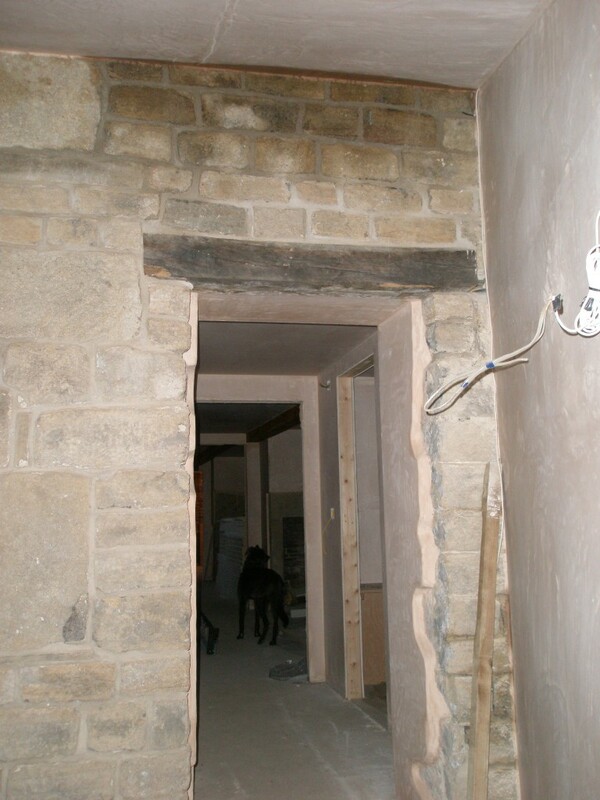 We believe that the rain is soaking into the exterior stonework and then running down behind the lead. One way of solving this is to treat the exterior stonework with waterproofer – something like Clear Cladding from Belzona. Unfortunately, all of the suppliers have been closed over the Christmas period, so we will have to wait until the new year before addressing this one. It looks as if rain is penetrating the joint between the roof and the outer wall. The roof here is a mono-pitch. Putting an additional lead upstand has helped, but the rain is still soaking through the plasterwork. This has dried out a bit over Christmas, but clearly rain is still penetrating this part of the roof joint. The exterior of the porch is now finished although it still has to be pointed. The roof on the front elevation – over the kitchen and the porch – has also been finished. This means that we are in a position to get the gutters installed. 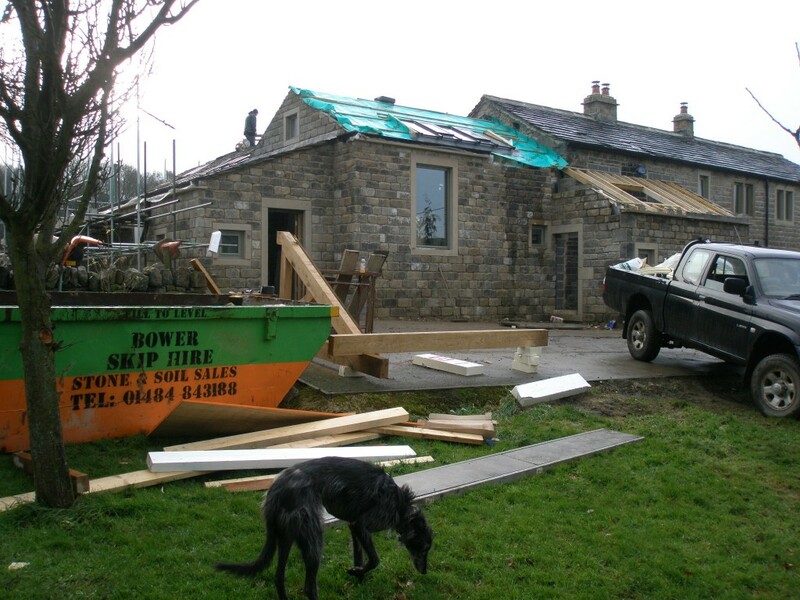 In keeping with the rest of the house, the gutters are cast iron from the foundry down the road in Holmfirth. We are using pattern 46 gutters – 5×4 on the new extension (as the gutters are lower) and 6×4 on the older part of the property. We have put 6×4 on the porch so that it matches the front elevation of the house. Once the gutters are in position, they are given a final coat of black paint. There is a sheet of plastic underneath the gutters to stop any black paint getting onto the ashlar underneath. 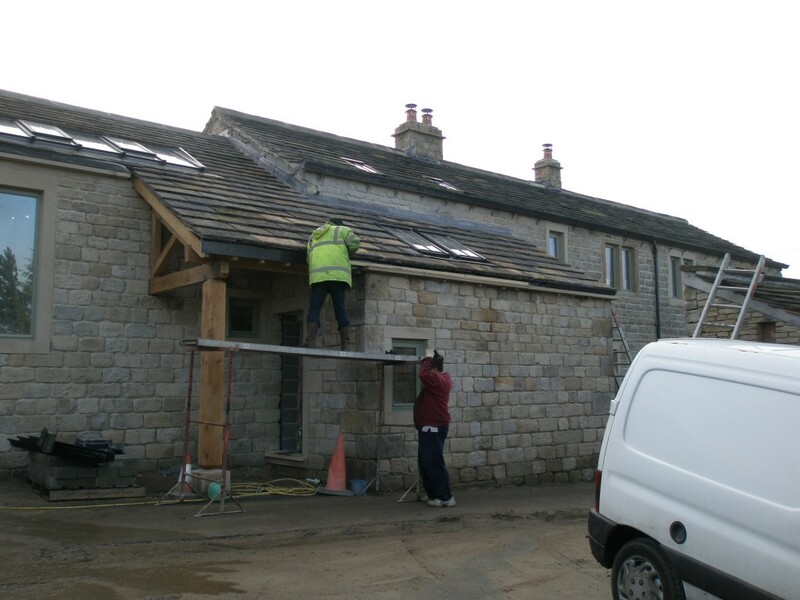 With the roof over the front of the kitchen and the porch now complete, we can put the gutters up. The gutters on the porch match the gutters on the front of the house – 6×4 cast iron gutters (pattern 46). 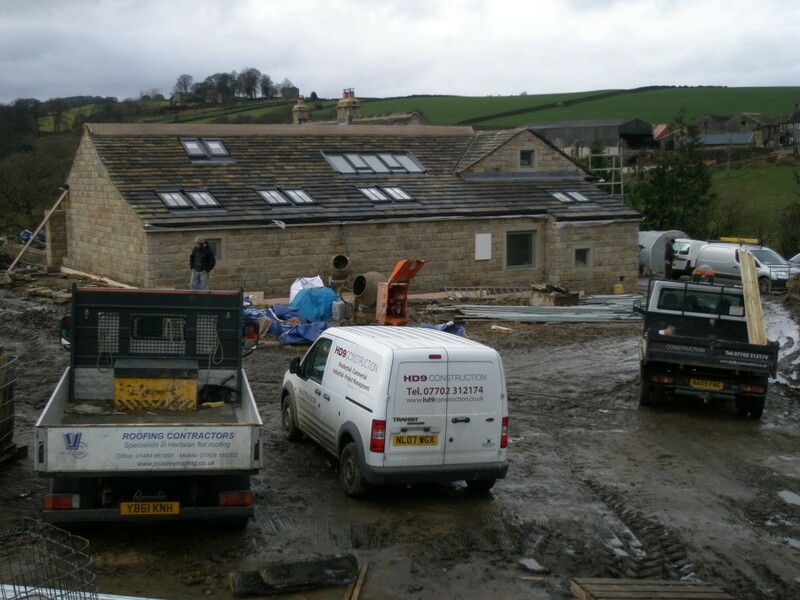 The gutters come from JJ Longbottoms – the foundry in Holmfirth just a couple of miles away. We have 14 workmen onsite today – 2 plumbers, 3 builders, 2 heating engineers, 2 plasterers, 3 electricians, 1 joiner and 1 roofer. And me. Trying to make sure that everyone has enough space to work is the main problem, but everyone seems to be getting along (just). The car (or van) parking situation is causing a little bit of a problem, but with the wet weather recently, it is jsut to muddy to get vehicles into the back field. However, it does mean that we are making a lot of progress. Only the ridge tiles to go on the kitchen roof and some lead flashings, then the roof is all done. Even as it is, it is water-tight. We have almost finished the upstairs bathroom. It will be good to get this one put to bed before Christmas. If the ground source heat pump is turned on at the end of the week, we may have some hot and cold water in the old house. The roof is nearing completion and by the end of the day, there is only two courses of slates plus the ridge tiles left to do. We should have this all sorted before the end of the week. 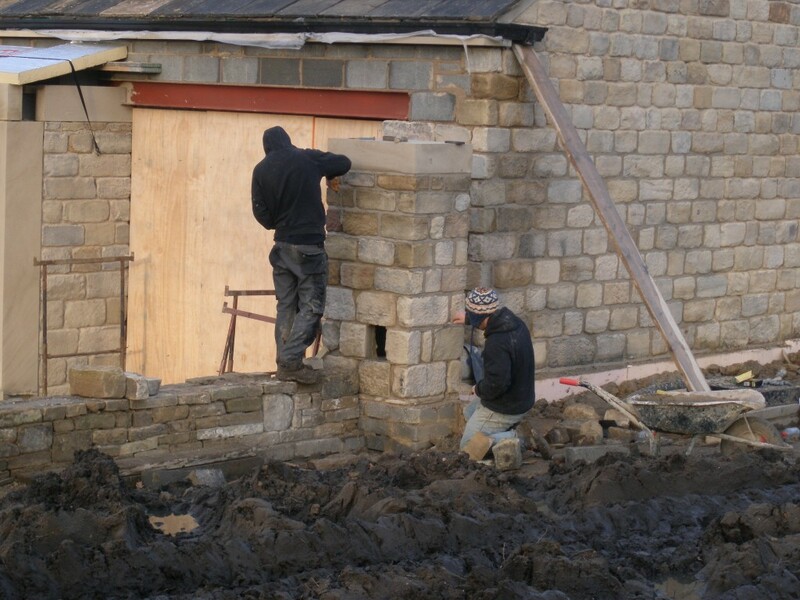 Now the stonework has been sandblasted, we can start on the pointing. This is a slow process. 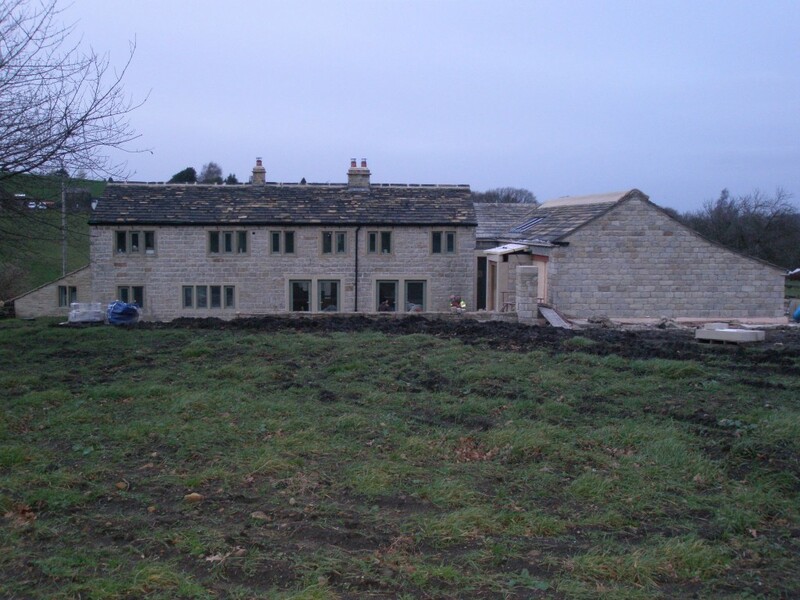 We are using a lime based render. It will probably take a couple of weeks to get all the pointing done. 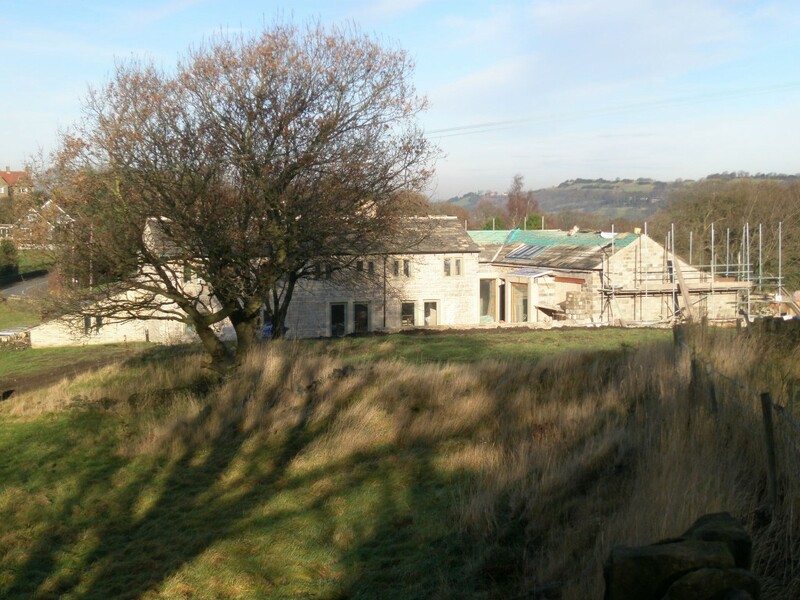 Now the scaffolding has been removed, we can sandblast the stonework on the new extension. We tend to do the sandblasting at the weekend because it is so noisy and messy. It just makes it to difficult to work on the site while the sandblasting is going on. The next stage will be to point the stonework. 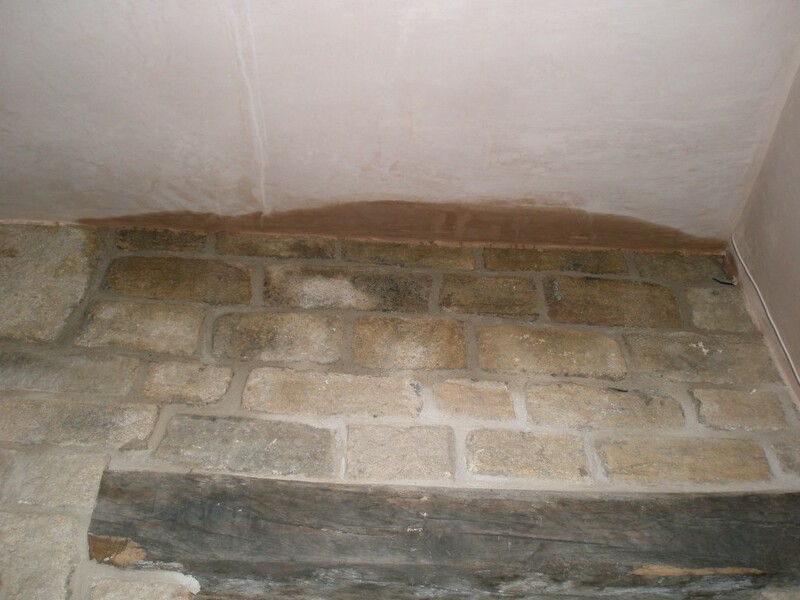 We will be using the same lime and Nosterfield River sand mortar that we used on the original part of the property. All of this stone has been brought in from offsite and is the closest match the we could find. The one exception are the quoins (the large corner stones) on the porch. These originally form part of the barn that was where the kitchen is now. This is the back of the porch. The small window is for the downstairs cloakroom. Although the roof is still to go on, serious progress has been made on the porch this week. 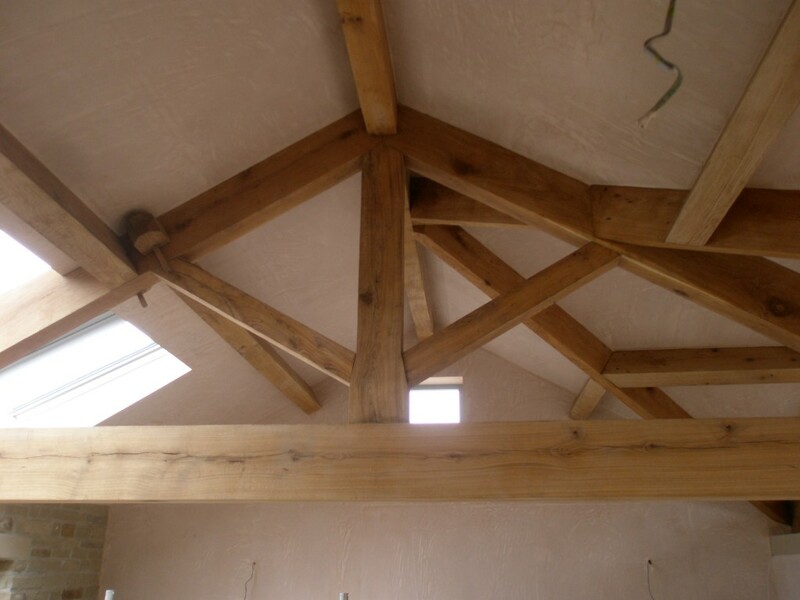 The canopy is built using oak similar to the internal roof trusses. 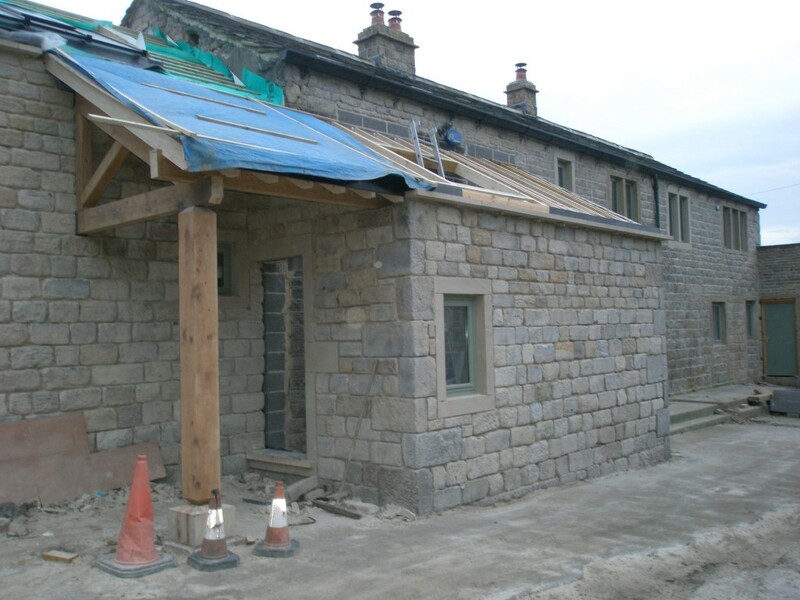 The stonework on the new extension and porch were sandblasted today. This effectively removes a loose dirt or paint from the surface of the stone. By the time that it is pointed, it will be close match to the existing cottages. The roof of the porch and kitchen will be finished off next week. 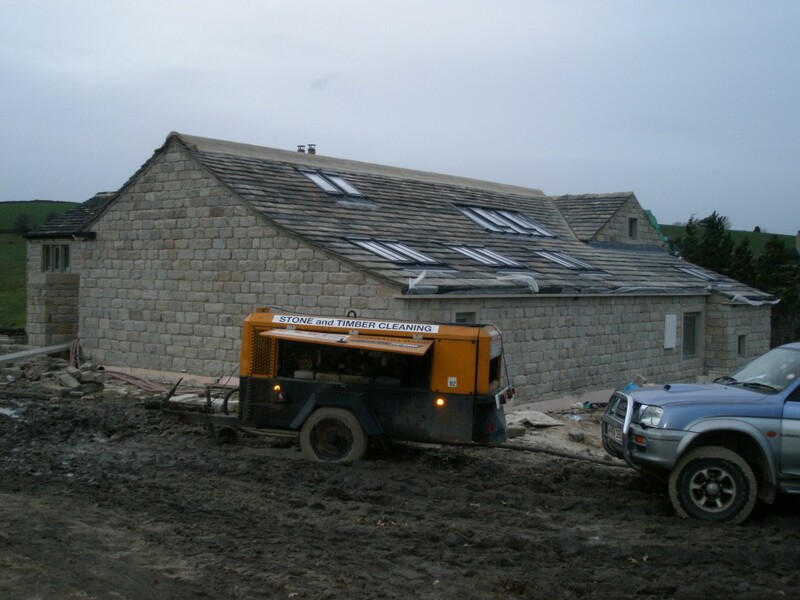 The rear of the extension has also been sandblasted. Even the small gable end in the kitchen has been cleaned. The white box next to the utility window houses the new (three phase) electricity meter. I do wish they came in colours other than white! Yup. This is the compressor that is used to clean the stone. It is a pretty noisy and sandy business. Definitely not for the faint hearted! 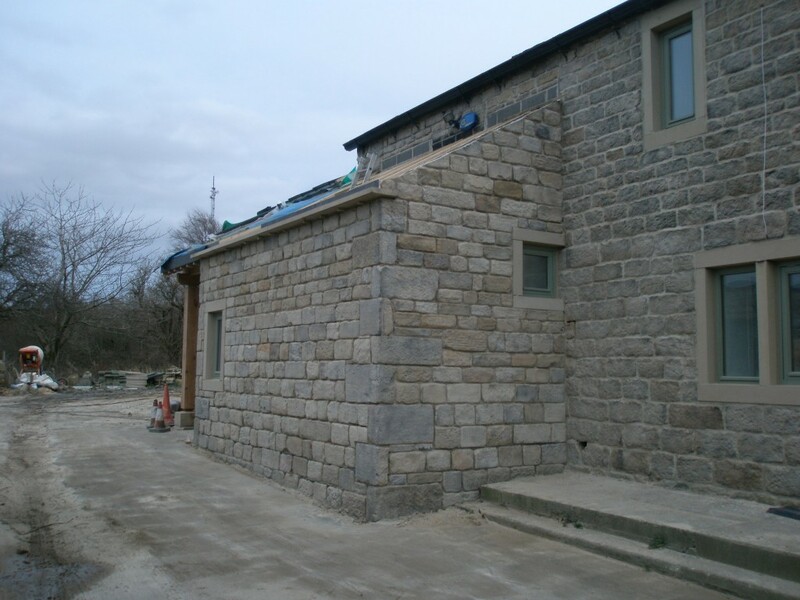 All of the exterior stonework on the extension has been sandblasted so that it matches the existing cottages. There is a lot of stonework here, but it is easily cleaned in a day. The hessian cloth on the ridge of the roof is to prevent the mortar being washed away on the new ridge tiles. 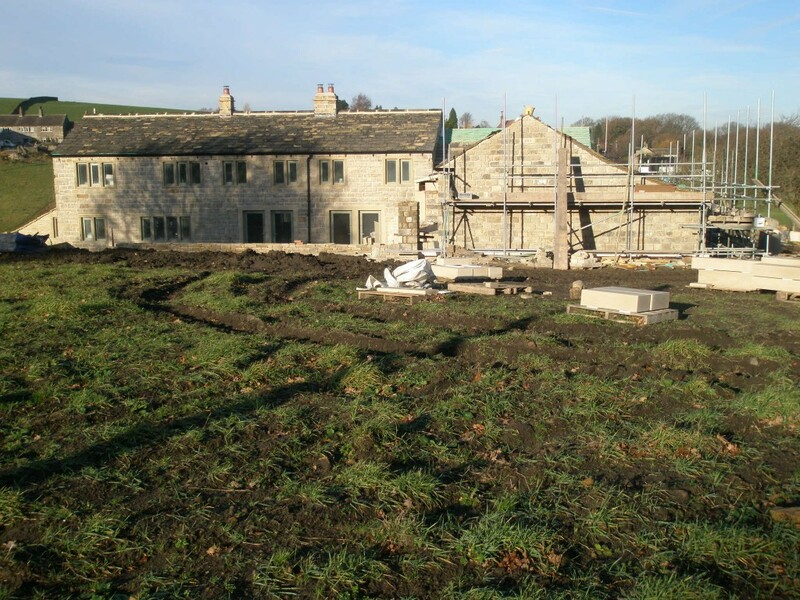 There isn’t much stonework on this elevation, however, the small areas that are here have been sandblasted so that it matches the rest of the property. 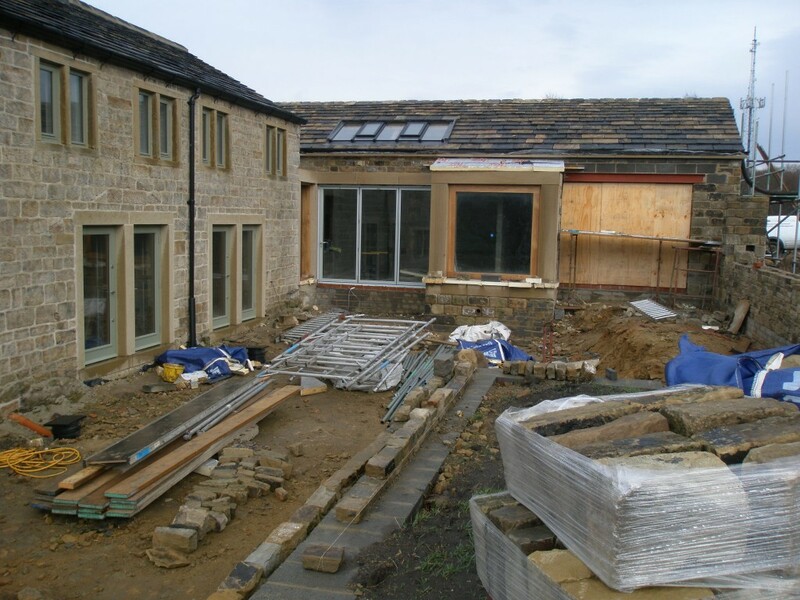 Unfortunately, we are going to have to wait until the new year for the bi-folding doors to be fitted in the master bedroom. You can see the strip of hessian placed on the ridge tiles to protect the mortar from the wet weather. We have started to remove the scaffolding from the extension. 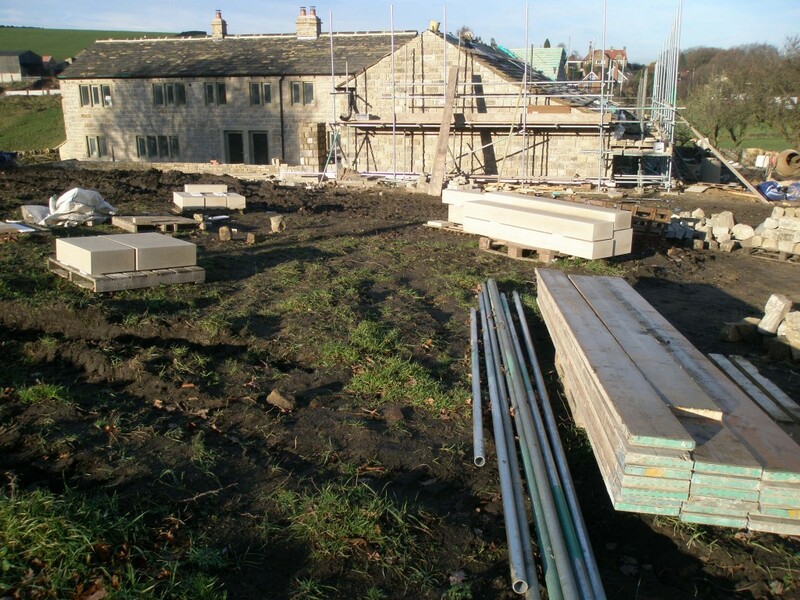 There is still some work to be completed on the porch, but most of the external building work is drawing to a close. 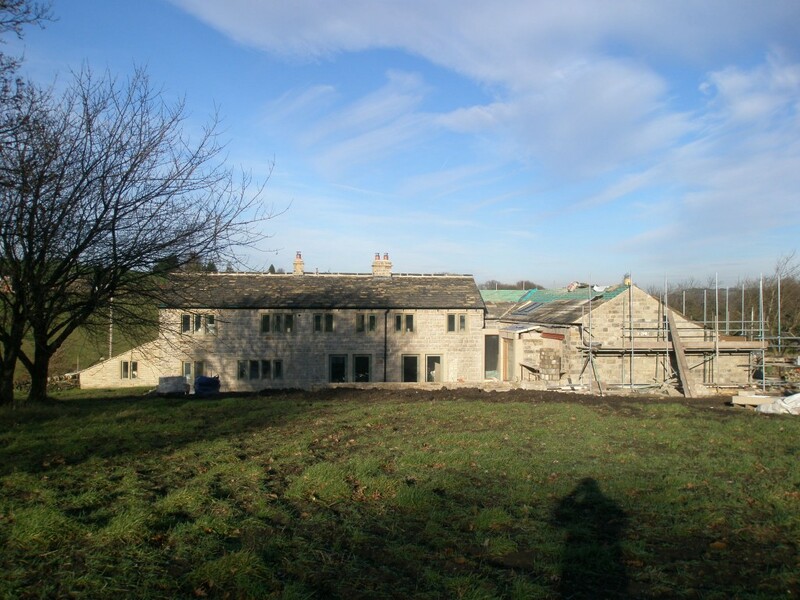 Taking the scaffolding down has made a tremendous difference to the overall appearance of the property – it is starting to feel like a real house now! Zep on the hunt for a cornish pasty. None here. In the background is the half truss that will form part of the canopy for the porch. The new kitchen wall is revealed now the scafffolding is down. The sunken garden has becoming a bit of a dumping ground for scaffolding and other items. The stones wrapped in cling film are the coping stones for the garden wall. I haven’t got around to sorting them out yet! Not such a nice day today as it was yesterday. Today, it was warm and wet. Very little sun, but mild for this time of the year. 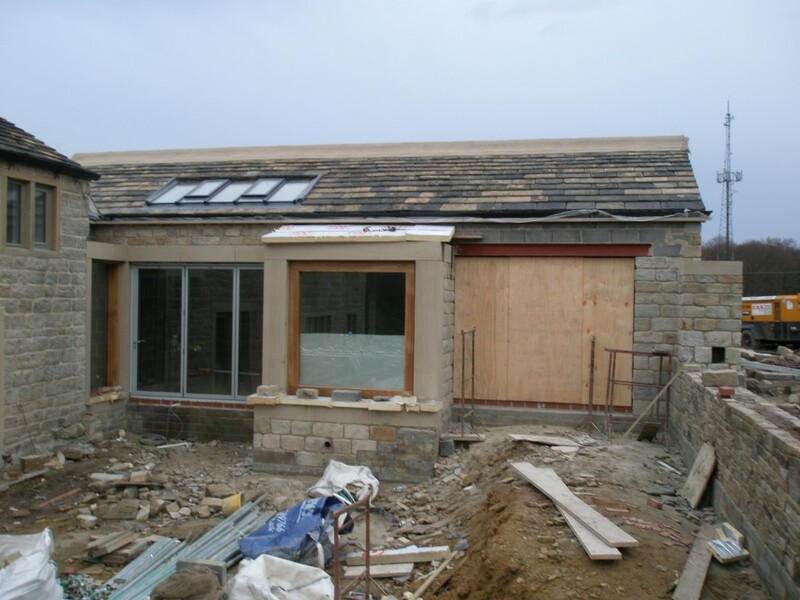 Now the front elevation of the extension roof is nearing completion, you can see how well it matches the existing stone slate roof. It is a shame that the bi-folding doors in the master bedroom were the wrong size, however, these should be fitted early in the new year. There is an oak beam and canopy to be built over the master bedroom. Well, if you have reclaimed stone slates on the roof, it seems only right that the ridge tiles should also be reclaimed. This ridge tiles are hacked out of solid pieces of stone and probably (at least) a couple of hundred years old. We have had another fine day here in West Yorkshire. This has allowed the roofers to get on with their job. We have definitely passed the half way mark on the extension roof. 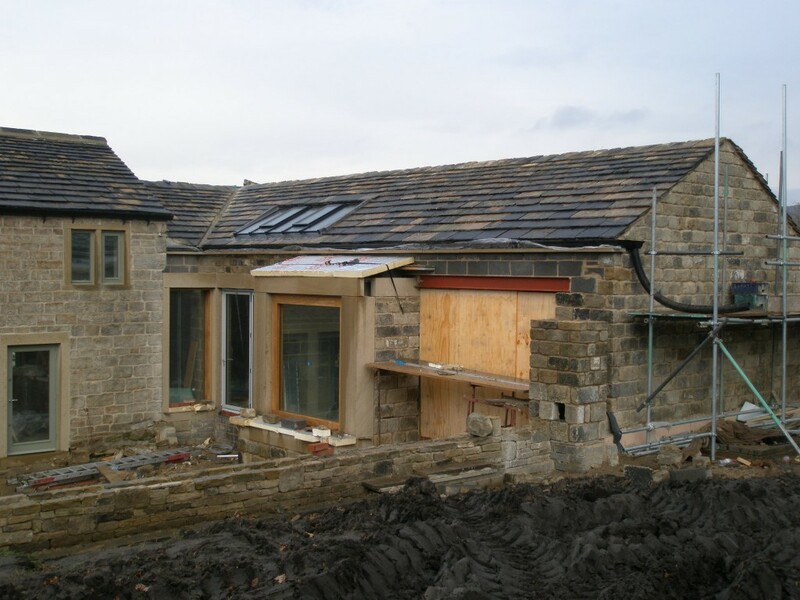 While the rear elevation of the extension roof nears completion, the front elevation is still only half slated. The roof should be finished in the next week or so, but enough has now been done that the scaffolding can be removed. Another beautiful day in Yorkshire. Bright sunshine. And it is December. Let’s hope there are lots more days to like this to come. 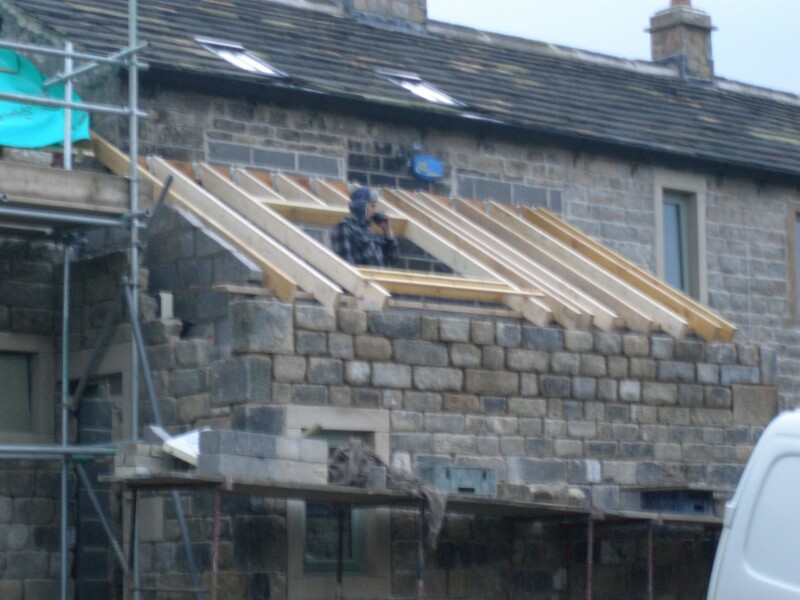 The roof on the rear elevation of the extension is now complete. Attention is now turning to the rear elevation of the kitchen roof. The scaffolding should be taken down by the weekend. This will allow the stonework to be sandblasted over the weekend. 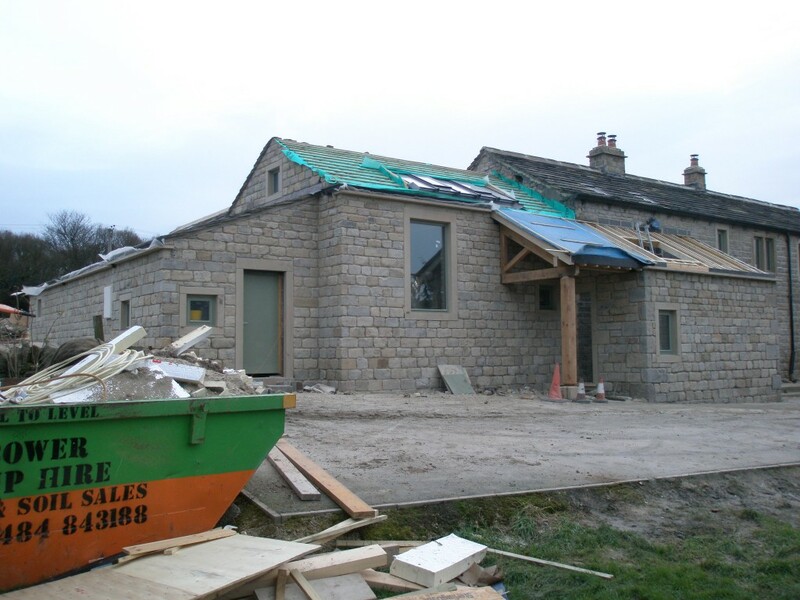 The rear roof elevation is nearing completion and there is only a few odd bits of ashlar left to install. We are making some good progress on the extension roof. All of the Velux lights in the rear elevation have now been installed. This includes an additional pair that we put into the master bedroom. The master bedroom has bi-folding doors, but no other windows. If you want to sleep with the window open at night, the only option would have been to leave the bi-folding doors open. Probably not a good option on the ground floor. So we decided to add a pair of Velux lights. We have put them on the rear elevation since most of the bad weather hits the property from the front. 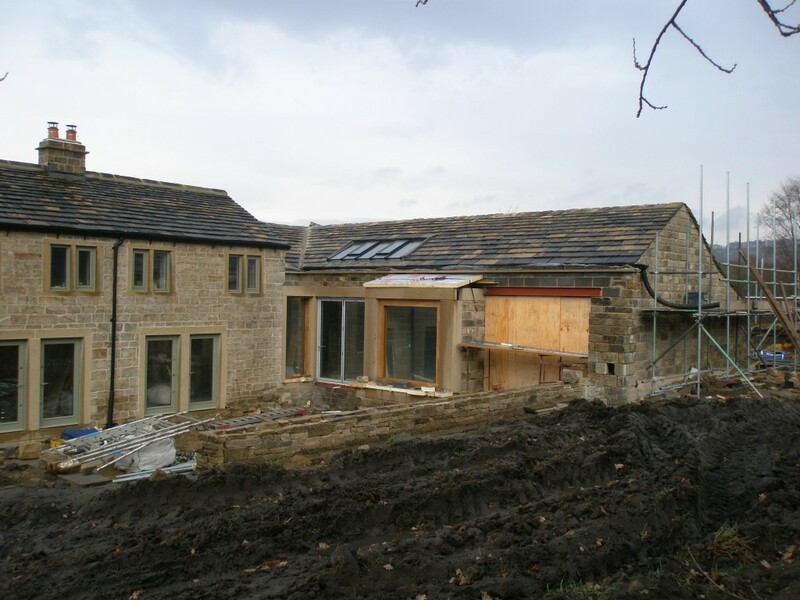 We were concerned about the amount of noise that rain would make on these windows in bad weather (not that we get bad weather in Yorkshire!). We will have to get some electric blinds fitted to these as there are about 4m above the bed! 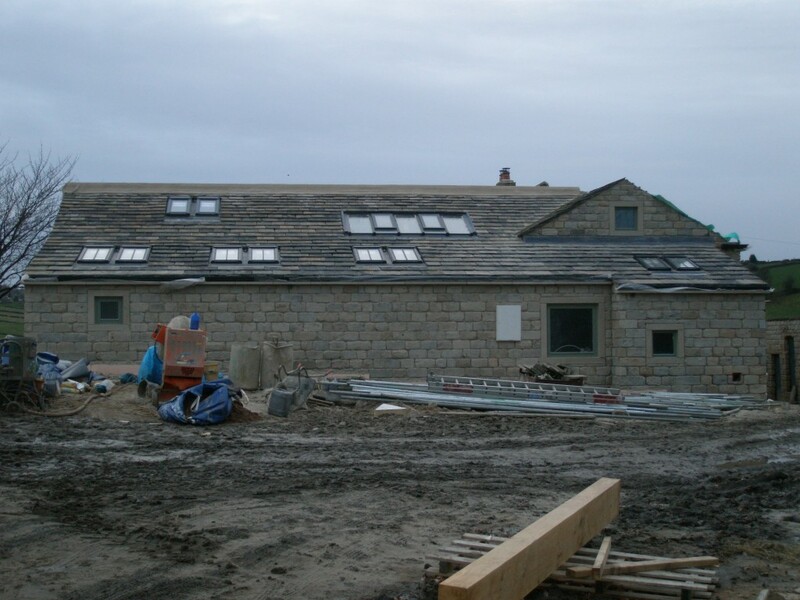 We are using reclaimed stone slates on the new extension roof. These are fairly common in this area on properties on this age. 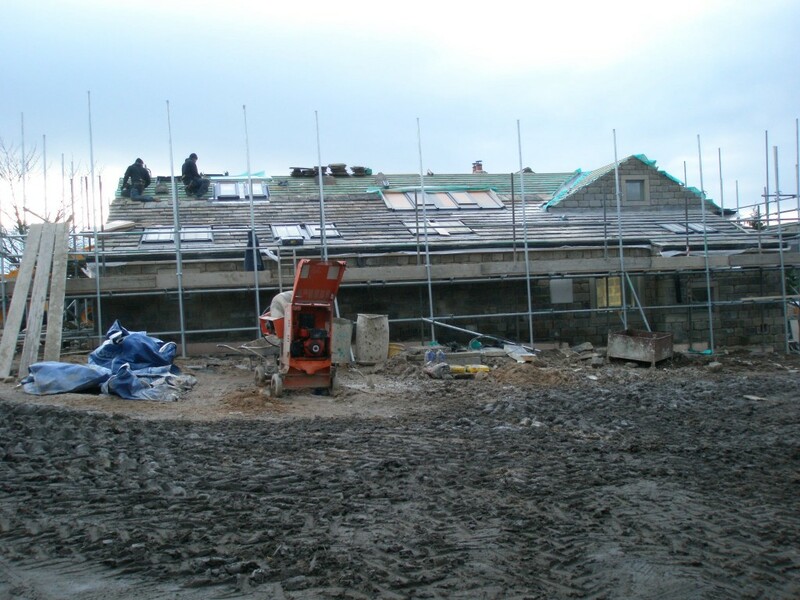 By using reclaimed slates, this roof should match the roof on the existing property. 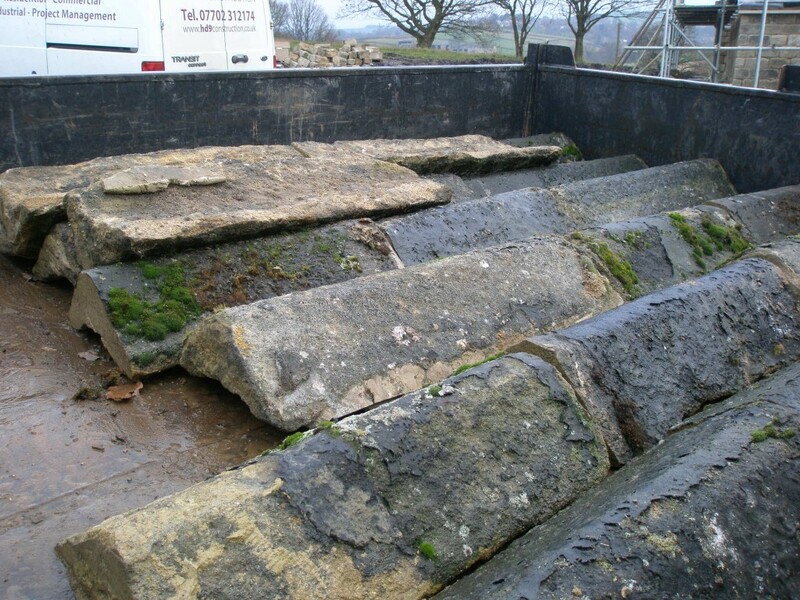 Just because these slates are reclaimed, don’t think that they are cheap. They aren’t! They can also be quite difficult to get hold of, particularly if you are after a reasonable quantity. We were lucky and came across some a couple of months ago. We bought them and stored them offsite on pallets until we needed them. Probably another day or so on the rear elevation and this part of the roof will be finished. We have made quite a bit of progress on the porch in the last week or so. The roof joists went in today. There are a pair of Veluxes in the front of the porch roof. The porch extends with a canopy that covers the front door. However, we won’t be able to finish this until the scaffolding is removed. And we can’t do that until the main roof is finished – probably in about a week’s time. The stone in the porch needs to be sand-blasted before it can be pointed. At which point, it should be a pretty close match to the existing property. The roof finally went on the porch today. This is Andy the Joiner doing a fine impression of a tank commander while have a cup of coffee! This oak half truss supports the canopy over the front door. 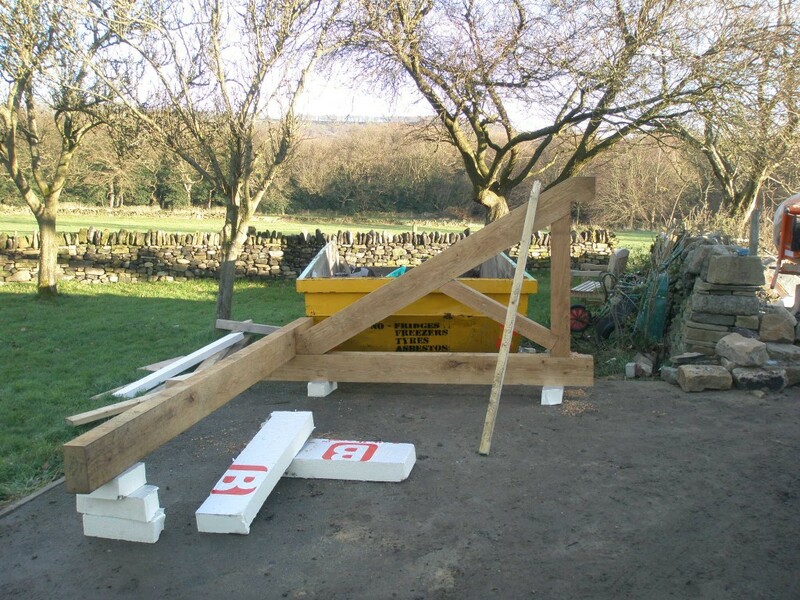 This has been assembled on the ground to sort out the overall measurements.